Can you believe, two months into the New Year, and I’m still seeing a ton of healthy recipes all over the internet! The exciting thing is that I’m eating them too. I’ve been nomming on salads, veggies, real whole grains, and just a ton of things that are good for me. I have definitely been feeling better because of that! I will tell you, as a vegetarian, one of the hardest parts of trying to live a healthy lifestyle is making sure I’m getting enough protein. One of my favorite things to do is lift weights and tone my muscles. Well, without the proper protein, the muscles I’m trying to build are just going to stop repairing themselves and stay small. As you can imagine, I am always on the lookout for healthy sources of lean protein that don’t include a ton of fat and haven’t moo-ed at any time of their lives. The solution: Egg Whites! But then there’s a ton of waste with all those extra yolks, and let me tell you, this girl does not need custard after her workouts. So when I heard about AllWhites® egg whites, and they wanted me to create a recipe using their amazing product, I was totally on board. All Whites has 5 grams of protein, 25 calories, and is a fat- and cholesterol-free alternative to traditional eggs in a shell. With all of that being said, I knew the true test was going to be the taste test, not only for my super open-minded palate, but for my son’s tastebuds as well. I knew I could use All Whites in any recipe that called for eggs, but I really wanted to up the health-factor with lots of veggies too. I already knew my kiddo was a fan of my quiche, I just didn’t know if he was going to welcome JUST egg whites quite as much. Well, the verdict is officially in: It’s a winner! There was no complaining. No whining. No picking at it. Only eating and mm-mmmm-ing! Preheat oven to 350 Degrees F. Spray a deep-dish pie pan with non-stick spray. 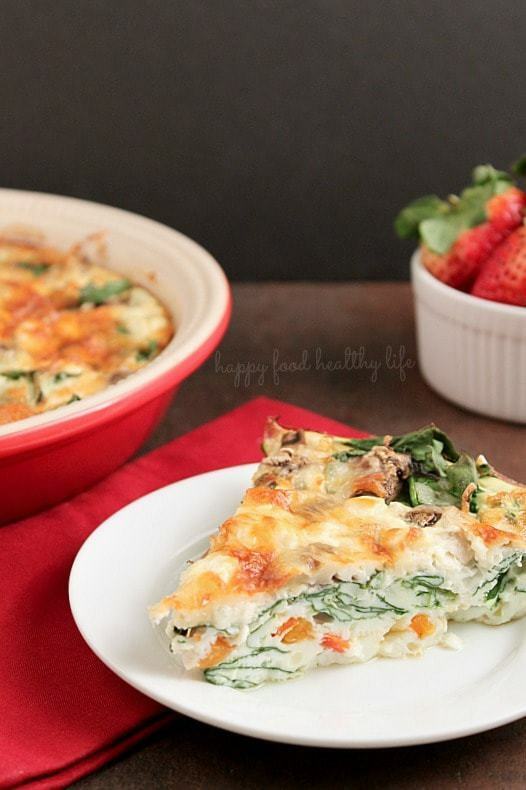 Layer the pan with spinach, peppers, mushrooms, and feta. Pour the entire package of AllWhites 100% Liquid Egg Whites over the vegetables. Top with Mozzarella. Place in the preheated oven for 45 minutes or until eggs are mostly set and the cheese has browned to a golden-brown color. Remove from oven and allow to set for about 10 minutes. Slice and enjoy topped with fresh salsa and a side of fruit. 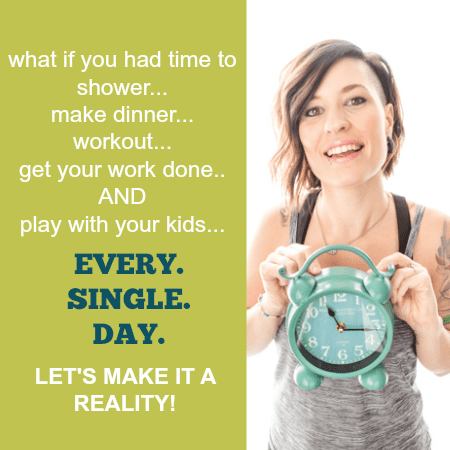 So I want to know: How YOU fuel the way to a healthier you! I fuel myself to a healthier me by eating more organic, whole grains, salads and egg whites. By eating protein and veggies. I trade off. IN the mornings I will have OJ and a banana and greek yogurt where I add pomegranate seeds. Sometimes I will have an egg sandwich with turkey sausage. This recipe looks delicious! I workout in the morning, so protein is always my focus at breakfast. We do eggs and egg white omelets quite often and I tend to get stuck in a rut. This is definitely being pinned and going into the rotation! I try to eat fruit when I need a sweet healthy snack. We keep a lot of fruit and veggies in the house. The trick is to wash and cut them so you reach for the colorful stuff before grabbing for junk food. This recipe looks so good! How do I fuel? 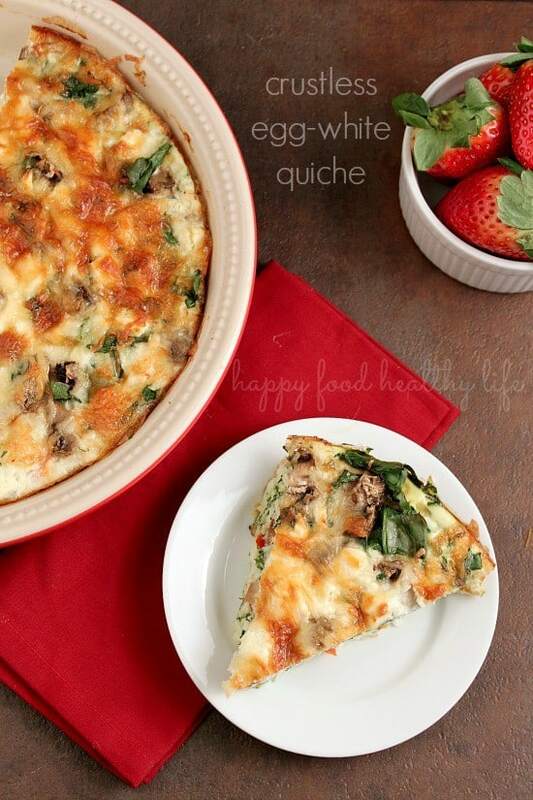 Love my healthy recipes – omelets, salads, fresh fruits and veggies. I fuel up on proteins, fruits and vegetables and stay away from sugar and junk food. I fuel my way with a healthy diet rich in protein, healthy fats and other necessary nutrients! I also take vitamins and drink a lot of water. I generally start my day with some scrambled eggs, cheese string and black tea. I’m making a real effort to increase my water intake daily. Helps my body use the food I eat more efficiently! we eat egg whites, fruit and orange juice… at least we try too! I love quiche! I usually have oatmeal for a healthy breakfast, but might try this soon! I add lots of veggies to my eggs and wheat bagel. I try to cut out a lot of sugar which happens to be my weakness. I try to drink lots of water, eat healthy and take vitamins daily. I try to eat more veggies and fruits every day. I like to bake with egg whites and almond milk; there’s almost nothing you can’t do with them. I include protein with just about every meal in order to keep my full and satisfied longer. I try to start the day off right with a healthy breakfast. This usually involves either oatmeal, fruit, veggies, or eggs/egg whites. If I have a healthy breakfast, I’m more likely to make healthy choices throughout the rest of the day. I eat lots of fruits everyday. Eggs are often my choice for breakfast and a good source of nutrition, especially All Whites. I use them as a source of protein to my now meager diet of less meat. I try to eat a healthy diet and exercise. Going breathless (with anaerobic exercise) a little bit every day. And healthy food! My son and I are on a protein health kick. We fuel up on oatmeal and egg whites with a protein shake every morning. Using AllWhites makes life so much easier. We love it. the quiche it is amazing.. I fuel up with a bowl of real oatmeal every morning (not the processed, fake flavored stuff!). It fills me up and gets me through the morning without snacking. Thank you! The quiche looks great. I usually start my day with a warm bowl of oatmeal, and sometimes end it that way also. I try to eat organic fruits and veggies, and drink plenty of water to stay healthy. I recently discovered using Egg Whites and use them in a chocolate smoothie from Rocco Dispirito’s recipe. 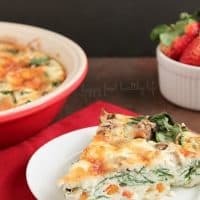 I’m going to try the Crustless Quiche as I love Quiche Lorraine. I’m trying to walk more and eat a lot more veggies and less fast food. I fuel by starting the morning off with a good breakfast. Usually Greek yogurt and cereal and fresh squeezed juice and some fruit. I make sure that I have water with me through the day and I take vitamins and supplements. There are days also that I will make an egg sandwich as a wonderful quick easy to go breakfast. I wll put perhaps a slice of canadian bacon and some fresh tomatoes as well. We start almost every day with a fruit and vegetable smoothie. Our Blendtec has over 700 uses! Lokks like a wonderful recipe! I eat lots of fresh veggies. take a multi vitamin every day. drink lots of water, and limit my daily fats and sugar. I eat brown rice with steamed veggies. That and I limit my oil intake to olive oil. I like to snack on fruit and vegetables. I eat fresh fruits and veggies, water with every meal, and multivitamins everyday. I fuel my way to a healthier me by eating breakfast daily consisting of fruit and low fat yogurt and I always pack my own lunch with healthy salads and sandwiches. Breakfast is a must at my house and it is cereal or oatmeal with fruit 6 days a week. One day a week is what we call “big breakfast” and it is everything but the kitchen sink: tortillas, beans, veggie meat, sauté mushrooms, onions, peppers,spinach, okra, eggs, potatoes, salsa, cheese. Having that once a week big breakfast feels like a special treat and keeps us eating right the rest of the week. I drink lots of water daily and eat veggies and fruit. I limit my salt intake and refrain from drinking sodas! I go heavy on vegetables and lean proteins for my meals and try to stick with whole grains as much as possible. I eat healthy, balanced meals throughout the day and I also take some supplements. I have a smoothie every morning – kefir fruit romaine and chia seeds – thank you. I try to eat something healthy 1st thing in the morning, it seems to set the tone for the day. I also drink a lot of water and try to walk at least 5 days a week. I make smoothies and eat lots of lean protein! Whey protein shakes are my way of fueling up for the day! I have started eating less fried foods and this has helped me to lose some of my extra pounds and get back into shape. I take lots of vitamins and minerals, and other supplement prescribed by my doctor as well as eating mostly healthy food with lean protein, lots of veggies and some fruit each day. I’m a vegetarian, so I always have to be careful about getting enough protein. I usually start my day with whole wheat toast and peanut butter. And when I feel like a snack I try to think of something high in protein that will be satisfying instead of eating something high in sugar. That usually means Greek yogurt and almonds. I love white meat chicken and try to eat it at least three times a week as well as a lots of fruits and veggies. I try to add veggies or fruit to almost anything, and I drink plenty of water. I drink more water and go for walks. I just quit eating breads and pastas. That was my downfall. I make a breakfast smoothie with frozen strawberrries, bananas, pineapple and almond milk for breakfast or a midday snack. I’m making a real effort to remove added sugars and carbs from white foods from my diet. It is so hard because every canned or jarred food has extra sugar added. I am eating a low fat diet, cutting out fast food and junk food and exercising two to three times a week. To fuel my day I drink vegetable juice. I cook from scratch for my family using fresh eggs from our hens, and hopefully this year fresh veggies from our garden! I also offer snacks like kefir, yogurt or bite-size pieces of fruits and vegetables to my children (and myself!!) when hungry between meals. I eat lots of protein. I tried to avoid fried food that I love and try to find healthier baked alternatives. im trying to cut out sugar. whew! its hard. your recipe looks so yummy! I eat a lot of fresh fruits and veggies. I incorporate fresh fruit and vegetables into every meal. That’s especially easy when my garden is producing. I started by making healthier choices in my life between diet and exercise. I love to start mornings off with a homemade smoothie that usually consist of yogurt, mixed berries, bananas, flaxseed, baby spinach, and other fruits that may be on sale that week. I drink lots of water and try to portion control meals. I fuel the way to a healthier me by avoiding fast foods, drinking plenty of water, swimming 3 times a week and walking the other days. I haven’t tried the AllWhites, but I will now since I want to try your quiche. I no longer fill up on waffles and cereal for breakfast. Now I eat 1/2 cup of plain oatmeal! I take in a fair amount of protein. i eat a lot of low fat proteins to fuel the way to a healthier me. i love chicken, tuna and egg whites. incorporated more fruits and vegetables, less salts and oils. I drink lots of water and no soda. I try to eat fresh veggies and fruits and no processed foods. I’ve also started to make a lot more meals at home from scratch. I also start the day with a healthy breakfast, which I never used to do. I watch my calories, fat and carbs. I eat oatmeal and walk as often as I can. Lots of home made meals. I drink lots of water daily and also eat my fill of fruits and veggies!